TOKYO — In sports, it’s normally the adults who preach about sportsmanship and fair play, while it’s up to the kids to absorb that information and hopefully take it to the field with them with an intent to do things the right way. But on Friday at the Tokyo Dome, the tables were turned, and the adults — namely, the players on both sides of the diamond participating in the Japan All-Star Series — were making a promise to the kids to, quite simply, behave themselves. Just before first pitch on Friday, both teams took a “Players Oath,” pledging integrity and sportsmanship. 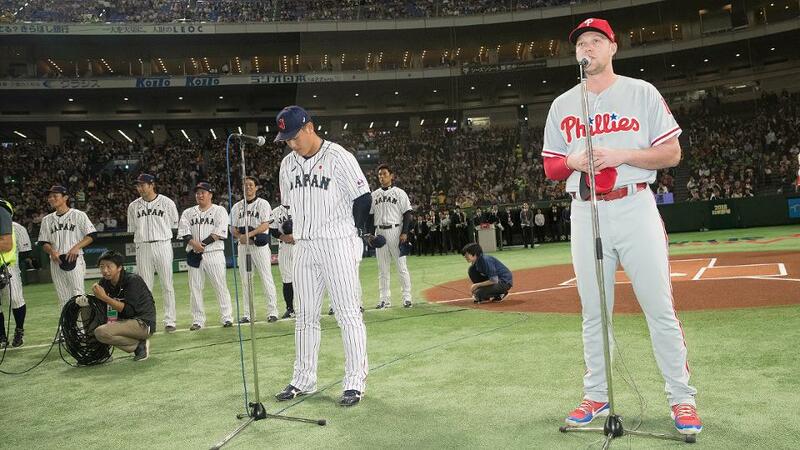 In front of a sold-out Tokyo Dome — and more significantly, to 50 youth baseball participants who were invited onto the field to hear the pledge — one representative from each team recited the pledge in his native language. For the Major Leaguers, it was Hoskins; for the Japanese All-Stars, it was outfielder Kazuma Okamoto. MLB was supported in the venture by both Nippon Professional Baseball and The Baseball Federation of Japan in this public service campaign, a highlight of the new “Time for Fair Play” campaign that promotes year-round awareness of the importance of integrity in sports. For Hoskins, the on-field moment Friday brought back fond memories of his own childhood, when he was both playing and watching Little League baseball.